Biomolecular computing, encompassing computations performed by molecules, proteins and DNA, is a central area of focus in Synthetic Biology research and development, which attempt to apply engineering design principles in living cells. Two major computation paradigms have been implemented so far in living cells - analog paradigm that computes with a continuous set of numbers and digital paradigm that computes with two-discreet set of numbers. Here, we analyze the biophysical and technological limits of large-scale gene networks created based on analog and digital computation in living cells. More speciﬁ cally, we calculate the precision of analog systems and the noise margin of digital systems in living cells. We conclude that both systems are challenging to operate with low protein levels. To overcome this challenge, we show that analog systems should operate with a Hill coefﬁ cient smaller than 1 and digital systems should be buffered. 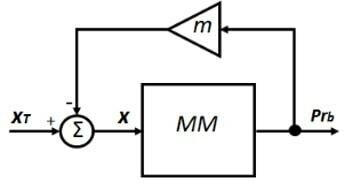 Furthermore, an analytical description of a biophysical model recently developed for positive feedback linearization circuits and used in analog synthetic biology, is presented. Finally, we suggest new directions for engineering biological circuits capable of computation. Computation has become an integral part of our evolution and marks a signiﬁcant landmark in modern technological revolutions. The ﬁrst abacus “calculator” was invented before 2000 BC and was based on counting continuous numbers, a process known today as an analog computation. However, scaling the complexity of computation was only truly achieved in the last century, when the digital transistor that counts discrete values, was invented. Computation based on digital design is relatively straightforward, with clear ON and OFF states that can and provide reliable results and form the basis for screening. Furthermore, digital circuits, with tightly controlled physical parameters, can be simply assembled to form complex networks, with very low cross-talk between components. The evolution of digital computation mainly relies on shrinking the transistor dimensions, which have almost reached the fundamental physical limits of scaling laws, breaking Moore’s law. In contrast to digital design, analog design computes with a continuous set of numbers, with each wire carrying many bits of information. In addition, it uses the powerful laws of physics, that are naturally embodied in analog transistors, to execute sophisticatedcomputational functions (e.g. addition, subtraction, multiplication, division, logarithms and power laws). The evolution of analog computation mainly relies on feedback loops to improve precision, attenuate noise and expand the working dynamic range. The last decade witnessed major breakthroughs in biophysics and genomic technologies. Researchers have successfully applied biophysical models, by combining several genes to create basic biological networks with predictable behaviors in living cells[2,3,4]. At the same time, thanks to nanotechnology and biotechnology, signiﬁcant advancements in genome DNA engineering and assembly techniques have been achieved. An outcome of these advancements is an extraordinary set of design rules and engineering tools that enable massive reprogramming of the DNA code in living organisms, including humans. This new technology, known as “synthetic biology”[6,7,8], attempts to translate engineering design principles to rational biological design[9,10], to achieve multi-signal integration and processing in living cells for diagnostic, therapeutic and biotechnological applications[11,12,13,14]. For example, living cells can be programmed to produce pharmaceutical compounds that are extremely challenging to synthesize using existing methods, microbiome bacteria can be programmed to detect and respond to changes in clinical homeostatis, and gene circuits can be engineered to identify and eliminate cancer cells. These developments constitute a milestone that marks the beginning of new biomolecular computing technologies, based on nanoscalelevel gene-circuits in living cells, that set an alternative limit to Moore’s law. Early efforts at biomolecular computing have used binding and unbinding reactions to represent the “ON/OFF” or “1/0” logic states. Consequently, proteins that bind to DNA or promoters and activate high levels of gene expression, represent the “1” logic state, while unbound, free proteins yield low levels of gene expression, and represent the “0” logic state. Many genetic circuits that mimic electronic digital circuits, have been constructed to perform Boolean logic gates[18,19,20], counter and memory devices in living cells. However, because signals in living cells are graded in their nature[23,26] and do not generally exist in only two possible states, digital paradigms are often an oversimpliﬁed means of describing signals in living cells. Thus, such representation can lead to errors in construction and implementation of genetic circuits and challenge gene-network scaling in living cells[24,25]. To date, engineered artiﬁcial logic gates in living cells have been proven difficult to scale due to cellular resource limitations, a lack of orthogonal genetic devices, high leakage levels of synthetic genetic devices and the absence of suitably sharp input-to-output transfer functions[24,25]. Recently, genetic circuits have been constructed based on analog design. Such gene circuits take advantage of the complex operations already naturally present in living cells, to execute sophisticated computational functions. For example, analog genetic circuits exploit positive feedback loops to implement logarithmically linear sensing, addition, division and negative feedback loops while performing square-root calculations to determine chemical concentrations. Analog genetic circuits involve fewer components and resources, and execute more complex operations than their digital counterparts[23,26,27]. For example, an analog adder can be achieved by simply combining two parallel circuits, where each accepts different input molecules and produces common output molecules. This lies in sharp contrast to digital adders, which sum two “1” binary numbers, and require another stage to hold the new bit “Carry out” (“10”). For instance, a 4-bit digital adder may require more than 30 synthetic parts to operate, and at the same time, would place a substantial metabolic burden on a cell. By analogy to electronics, noise in biological systems[28,29] can set the physical and technological limits of engineered analog-design large-scale gene networks based in living cells. For an in-depth analysis of the pros and cons of analog versus digital computation in living cells and electronics, readers are referred to excellent reviews on the subject[1, 27]. In the present article, we analyze the biophysical and technological limits of large-scale gene networks created based on analog and digital computation in living cells. The working dynamic range, noise margin, basal (leakage) level of biological parts, sharpness of input-to-output transfer functions and copy number of synthesized proteins/molecules are assessed. In the second part of this paper, we analyze analog computation in living cells. We close the work with suggestions for future directions for engineering computation functions in living cells. 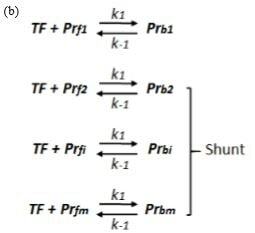 Equation 4 shows that by decreasing the Hill coefficient or the sharpness of the input-output transfer function of the binding reaction, one can increase the log-linear range. In natural biological systems, the Hill coefficient typically ranges between 1 and 4, and then the IDR varies between 1 to 0.25 orders of magnitude. Recently, Danial et al. showed that by implementing a graded positive feedback loop in synthetic biological systems, one can increase the IDR by 4 orders of magnitudes. In this case, the intrinsic noise can be viewed as the fluctuations in chemical/protein-protein binding and protein synthesis. While Equation 17 is only an approximation, it describes the precision of analog systems when the extrinsic noise is small. Under these conditions, the precision of the system is set only by the maximum protein copy number achieved by the system and by the intrinsic noise (Figure 2a ), independent of IDR. 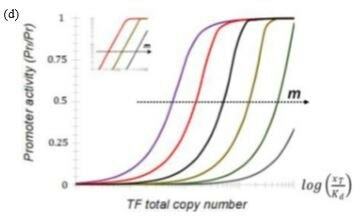 Analog systems can be alternative to their digital counterparts (1 bit of output precision) when operating with 4 to 8 levels of information (equivalent to 2-3 bits of output precision), which, based on our analysis (Figure 2a), can be achieved with 1000 proteins copies or molecular counts. In Escherichia coli, 1000 molecule counts is equal to a concentration of 1μM, which is typically the levels of signaling proteins (e.g., it was found that there are roughly 100 copies of EnvZ per cell and around 3500 copies of OmpR). 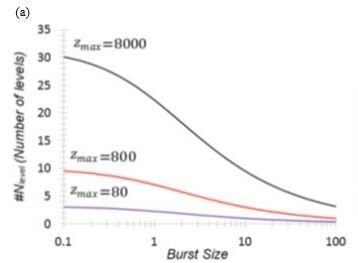 The burst size relies on the translation rate, number of amino acids (aa) in the synthesized protein and on mRNA half time. Typically, in Escherichia coli, the translation rate ranges between 10-20 aa/ sec, depending on growth conditions, and mRNA half time is around 3-5 min. 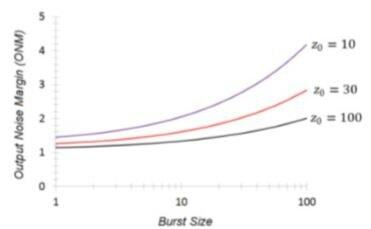 Therefore, the burst size in Escherichia coli, can range between 3-15. 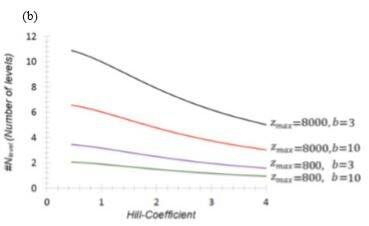 Figure 2b shows that, to achieve proper performance of analog systems based on protein-DNA biochemical reactions with 4-8 levels of information (2-3 bits of precision), the effective Hill coefficient should be smaller than one. The measured Hill coefficient in natural biological system is often higher than one, therefore, there are challenges in creating analog genetic circuits. Synthetic analog parts that operate in a log-linear mode with a wide input dynamic range, can be simply integrated into more complex circuits for higher order functions. For example, a genetic analog adder has been constructed in living cells by simply combining two analog synthetic parts (e.g., positive feedback loop and shunt) that each accept different input molecules and produce the same output molecules. The addition operator was achieved by summing up the common diffusion fluxes of output molecules. This operation is equivalent to Kirchhoff’s current law in electronics. By contrast, a genetic digital adder cannot be constructed using the same principle that exploits a common output signal, since every wire in digital design represents only a bit of information, and would require an additional stage to hold the carry out. For example, building a half 1 bit adder in bacteria requires 7 synthetic parts. Analog computation presents an alternative to digital computation when the number of synthetic parts is limited. An analog subtractor can be constructed using the same principles applied for the analog adder. The analog subtractor has two log-linear stages that produce common output proteins, one stage with a positive slope and another stage with a negative slope. Danial et al. 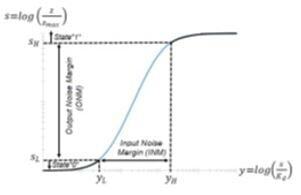 has used a LacI repressor to implement an analog stage with a negative slope. 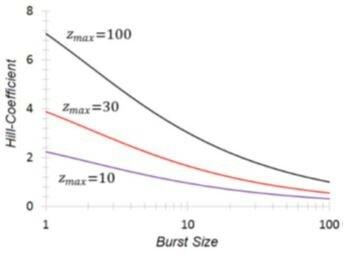 The last two equations quantify how the output noise margin of digital systems in living cells relates to intrinsic and extrinsic noise sources, Hill coefficient, basal level and molecule counts. Based on our analysis, in contrast to analog systems, the basal level is extremely important in determining the performance of digital systems (Figure 5d). Digital computation in living cells have been widely used in synthetic biology and have been reviewed in several articles[7,8,35]. In this article, we briefly reviewed and discussed two key synthetic digital devices that were implemented in living cells. In the AND logic gate, output is only high if all inputs are high. The devices were constructed in bacteria[36,20], yeast and mammalian cells, using a binding reaction between two synthetic parts regulated by input promoters. For example, Nissim et al. constructed a system with two inputs that are duplicates of endogenous promoters that regulate the expression of a two-hybrid system, with one part fused to an activation domain, and the other to a binding domain. Together, they form a transcriptional complex that can bind a synthetic output promoter to express an output gene. By design, output is only generated if both endogenous promoters are active in the cell above a speciﬁc threshold. 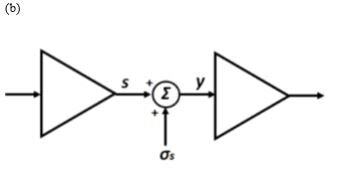 In the OR logic gate, output is high if at least one input is high. This device was constructed using two promoters that regulate the same gene. Taking different approaches, several groups have constructed logic gates and memory using recombinase proteins. Synthetic and Systems Biology have recently learned to exploit analog and digital genetic circuits for computation and decision making. In this work, we analyzed the precision of analog systems (Equation 18) and the noise margin of digital systems (Equation 29). We demonstrated that the performance of analog and digital systems in living cells is signiﬁcantly impacted by extrinsic and intrinsic noise sources. We showed that both systems are challenging to operate with low protein levels and that both systems require optimization. 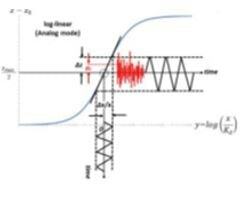 For example, analog computation operates with Hill coefficients smaller than 1 and cascading of digital systems increases the input noise margin, conditions under which the digital system has a graded behavior acting as an analog system. We also have shown that, in contrast to analog systems, the basal level is extremely important in determining the performance of digital systems. Furthermore, we argue that, compared to digital design, analog computation is very efficient in its use of synthetic parts, however, embedded digital systems can operate reliably with low molecular counts. Therefore, biological systems that integrate both analog and digital circuits may provide an alternative strategy for scaling the complexities of computation in living cells[26,27]. Although this design is widely used in electronics, in such contexts, it mostly aims to convert analog signals to a two-logic states and not to build efficient systems. Therefore, in our opinion, a hybrid analog-digital architecture in living cells should take a different approach than in electronics. 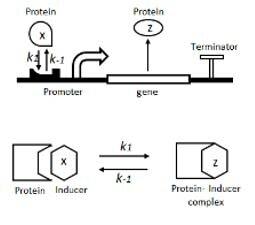 Figure 1: (a) Basic bio-computing elements in living cells, including a protein that binds to a promoter and an inducer that binds a promoter (k1 is the forward rate of the binding reaction, k-1 is the reverse rate of the binding (unbinding) reaction). 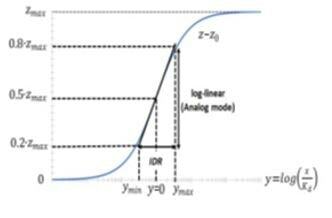 (b) Analog mode: input-to-output transfer function of equation 1 (blue line) and log-linear function at y=0 (black line). (c) Digital mode: Equation 1 represents two logic states “0/1”. Figure 2: Noise Tolerance Analysis for reliable analog computation in living cells. (a) The ﬁgure shows the precision of analog systems in a log-linear mode, when we take into account the contribution of intrinsic noise and input dynamic range (Equation 17). (b) The ﬁgure shows the precision of analog systems in a log-linear mode, when we take into account the contribution of extrinsic/intrinsic noise and input dynamic range (Equation 18). (c) a schematic model includes Michaelis–Menten and a negative feedback for the open loop and shunt circuit. 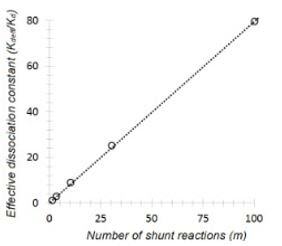 (d) Simulation results show the contribution of shunt biochemical reactions on the activity of the target promoter. 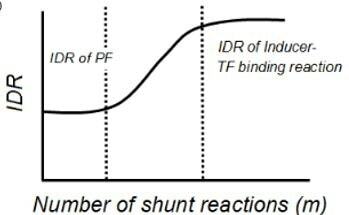 (e) The simulation results show the contribution of the shunt biochemical reactions on the effective dissociation constant. 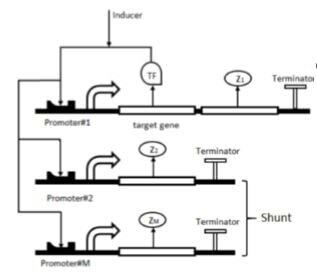 Figure 4: (a) Positive feedback loop and shunt circuit: the transcription factor is produced by its own promoter and binds to m identical promoters. 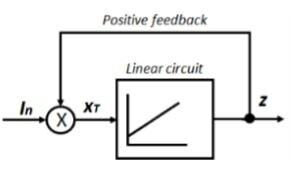 (b) A schematic model of positive feedback and shunt circuit includes a linear part. 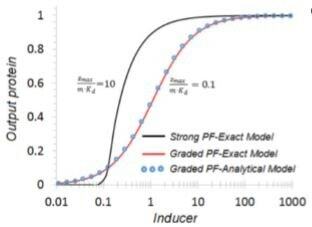 (c) Simulation and analytical results showing a graded positive feedback loop. Figure 5: (a) Input noise margin analysis for digital circuits in living cells (Equation 26). (b) Contribution of intrinsic noise to the output noise margin in digital circuits in living cells. (d) Output noise margin analysis for digital circuits in living cells (Equation 29). Sarpeshkar, R. Ultra Low Power Bioelectronics: Fundamentals, Biomedical Applications, and Bio-Inspired Systems (CambridgeUniv. Press, 2010). Gardner, T.S., Cantor, C.R., and Collins, J.J. (2000) Construction of a genetic toggle switch in Escherichia coli. Nature, 403,339– 342. Hooshangi, S., Thiberge, S., and Weiss, R. (2005) Ultrasensitivity and noise propagation in a synthetic transcriptional cascade. Proc. Natl Acad. Sci. USA, 102, 3581–3586. Carlson, R, Biology is Technology: the promise peril and new business of engineering life (Harvard University Press, 2010). Lu, T.K., Khalil, A.S., and Collins, J.J. (2009) Next-generation synthetic gene networks. Nat. Biotechnol., 27, 1139–1150. Chen YY, Galloway KE, and Smolke CD. Synthetic biology: advancing biological frontiers by building synthetic systems. Genome Biol. 13, 240 (2012) (doi:10.1186/gb-2012-13-2-240). Baker D, Church G, Collins J, Endy D, Jacobson J, Keasling J, Modrich P, Smolke C, and Weiss R. Engineering life: building a FAB for biology. Sci. Am. 294, 44–51 (2006) (doi:10.1038/ scientiﬁcamerican0606-44). JW, Kerns SJ, Shaket LA, Siraj, L, Collins JJ, Way JC, and Silver PA. Programmable bacteria detect and record an environmental signal in the mammalian gut. Proc Natl Acad Sci, 111:4838-43 (2014). Weber, W. and M. Fussenegger, Emerging biomedical applications of synthetic biology. Nat Rev Genet, 13(1): p. 21-35 (2012). Nissim, L. and Bar-Ziv, R.H. (2010) A tunable dual-promoter integrator for targeting of cancer cells. Mol. Syst. Biol., 6, 444. Tamsir A, Tabor J.J. and Voigt C.A. Robust multicellular computing using genetically encoded NOR gates and chemical ‘wires’. Nature 469, 212–215 (2011). 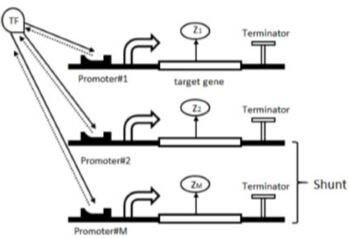 Bonnet J, Yin P, Ortiz M.E, Subsoontorn P and Endy D, Amplifying genetic logic gates, Science 340, 559-603 (2013) ( doi: 10.1126/science.1232758). Moon T.S, Lou C, Tamsir A, Stanton B.C, and Voigt C.A, Genetic programs constructed from layered logic gates in single cells, Natrue, 491, 249-253 (2012). Ajo-Franklin C.M, Drubin D.A, Eskin J.A, Gee E.P.S, Landgraf D, Phillips I and Silver P.A, Rational design of memory in eukaryotic cells. Genes Dev. 21, 2271–2276 (2007). Siuti P, Yazbek J, and Lu T.K, Synthetic circuits integrating logic and memory in living cells, Nat. Biotechnol., 31, 448-452 (2013). Sauro H.M and Kim K, Synthetic biology: it’s an analog world. Nature 497, 572–573 (2013) (doi:10.1038/nature12246). 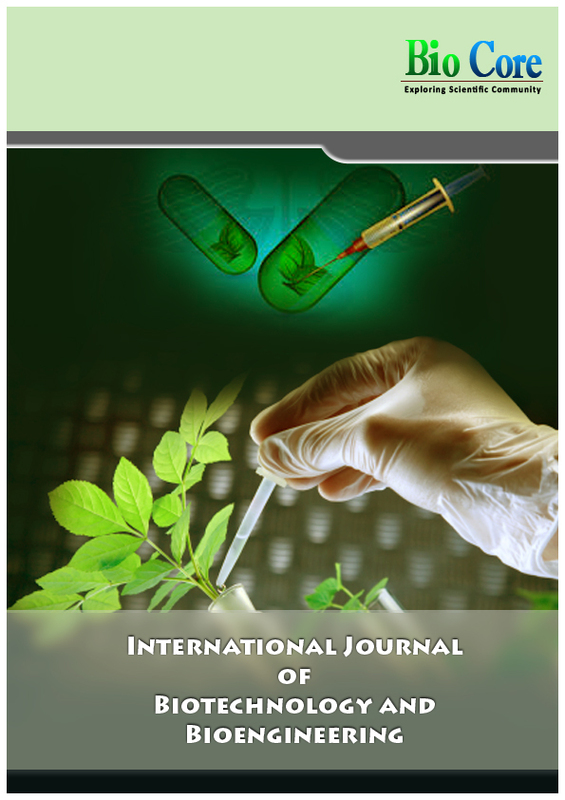 Arkin A.P and Cardinale S, Contextualizing context for synthetic biology–identifying causes of failure of synthetic biological systems, Biotechnology journal 7,7,856-866 (2012). Brophy J.A.N and Voigt C.A, Principles of genetic circuits design, Nat Methods, 101: 508-520 (2014). Sarpeshkar R, Analog Synthetic Biology, Phil. Trans. R. Soc. A 2014 372 (2014). Uri A. 2007 An introduction to systems biology: design principles of biological circuits. Boca Raton, FL: Chapman & Hall/CRC. Elowitz MB, Levine AJ, Siggia ED, Swain PS. Stochastic Gene Expression in a Single Cell Science. 2002 Aug 16;297(5584):11836. Wong A, Wang H, Poh Ch, Kitne RI, Layering genetic circuits to build a single, bacterial half adder. BMC Biology DOI: 10.1186/ s12915-015-0146-0 (2015). O. Purcell and T. K. Lu, “Synthetic Analog and Digital Circuits for Cellular Computation and Memory”, Current Opinion in Biotechnology, vol. 29, pp. 146-155, October 2014. Anderson, JC, Voigt, CA, & Arkin, AP. (2007). Environmental signal integration by a modular AND gate. Molecular Systems Biology, 3: 133. Nissim L, Beatus T, Bar-Ziv R., An autonomous system for identifying and governing a cell’s state in yeast, Phys Biol. 2007 Aug 16;4(3):154-63.